Directed Energy Weapons Are Being Used To Cause Strange Wildfires | Take The RedPill! I don’t usually jump to conclusions when it comes to the current events of today and those items presented to me for consideration of the content within. When I first heard anything of interest to my palate on these fires, I was presented with a video showing drone footage of the burned down houses in Santa Rosa, CA. At first I just took a glance at the video because I was busy writing a piece on something totally unrelated to these fires, so when I got a free moment I came back to the drone footage only to realize I had almost dismissed something phenomenal going on in California with these so called “Wild Fires”. When I examined the footage in more detail I could see that there was something very wrong with the fire scene. I have had extended training in fighting forest fires from my time up in Yosemite National Park where I took a couple courses with the Rangers / Hot Shots. We learned the basic 8 Survival course for surviving a forest / wild fire. Then I took the extended Fire 32 course. In the extended course they taught us the techniques used to create something called “Fire Breaks”. This is a staple of fire fighting in the forest because what it does is it creates a gap in the fuels needed by the fire to spread. Your most basic Fire Break is approximately 5 meters (about 16 1/2 Ft.) in width and this provides a zone to slow down the spread of radiant heat to other fuel sources such as downed trees and shrubs or twigs on the ground that would act as perfect kindling to help the fire spread to new areas of the forest. When you examine the footage of these fires you see just that and even other more strange anomalies that just don’t add up. While there are a great deal of “Fire Breaks”, it would seem that they did not stop the fire from radiating its heat outward toward cars on the street next to the burned out houses while at the very same time you can see that there are trees and shrubs right up against the very edges of these burned down houses that are still green and quite lush. It was as if the fire was “Dished out” to only certain areas and other fuels just seemed off limits. It was like the fire ate its meal like a fussy child. Some things it would consume and others it just “Skipped”, right over that fuel source, to a car or a mailbox. This was when I started digging further and I came across more videos, one from aplaintruth.info and another before that from TruthByGrace. 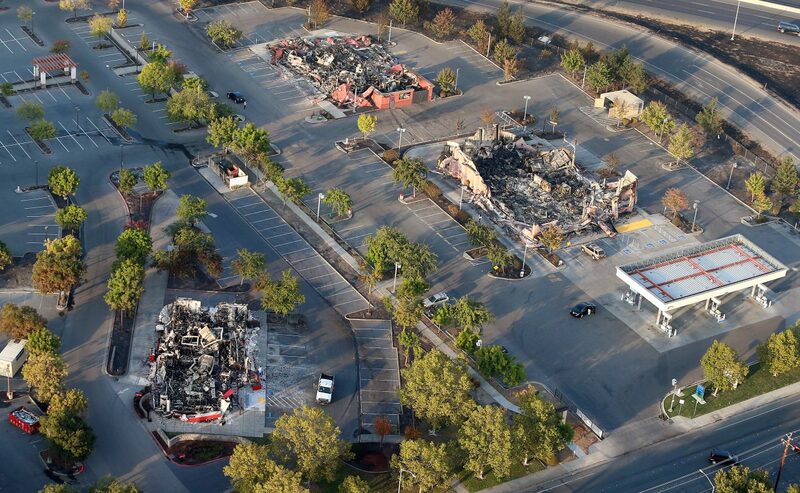 Both YouTubers were noting how odd the burn patterns were and how eerily familiar the burned out cars looked. TruthByGrace was comparing the damaged cars to those that were found on the site of the WTC Attack of 9/11 and in China after the explosion at one of their sites that was caused by a mysterious source. I think you’ve got it – also 9/11 was likely DEW induced – I was an eye witness, on an air-conditioned express bus in Brooklyn on the Gowanus Expressway watching the smoldering Twin Tower building when the second plane hit and I felt a warmth wash over my body. I knew there was something wrong with that experience, I should not have felt heat energy from the distance I was (about 3/4 mile). This is the age that we must all learn to trust our intuition. There are enough people doing the investigative work for which they should be commended. My intuition tells me we are being poisoned with toxic chemtrail spraying and that DEWs are being used to start these forest fires, as part of Operation Scorched Earth. My pintuition also tells me that it’s true, Donald Trump is making heads roll regarding this pedophilia national emergency. These criminals know every possible way to circumvent the law, which is why they are being handled differently than other criminals. For the sake of the kids, it’s time to just take these people out based on the mountains of “unmistakable” evidence that already exists. Does anyone know who is responsible? Anyone starting a court case? Much love to Northern California! NEW WORLD ORDER…………………IS THE GOVERNMENT THAT STUPID TO THINK WE DON’T REALIZE WHAT’S HAPPENING..?………….ULTERIOR MOTIVES..? Never forget they have 30,000Chanel guillotines. They actually used Army troops to move them. After one of the troops awakened he decided the military was not for people who are awakened. GET OUT! there were fires in a small beachside town in australia; tathra… it is VERY similar situation, and to make it weirder, the fire service waited a few hours before asking for assistance… i dunno why that town but the fire focused on houses and not so much the trees…. like they have other plans for the area……. really does feel like the end of the matrix…. world governments are keeping a big secret about the return of planet x & the return of the annunaki investigate all & share or go to FEMA CAMPS to get the MARK OF THE BEAST or your last supper! ronald freeland law on twitter! Many people on other sites are claiming the DEW theory to be false and claiming that green (wet) trees do not burn. If anyone on this site feels the same, I’d like an explanation as to why rubble was not found in Coffey Park, Santa Rosa (i.e. toilets, tubs, granite, tools, collapsed roofs, mattress springs, etc.) The entire site was vaporized, just like the Twin Towers. Those claiming the trees were wet and don’t burn because of that have no clue how forest fires work. On top of that they are discounting the fact that California has been in an engineered drought for the last half decade from Chemtrials. Anyone denying the mechanics and outcome of these fires caused by Directed Energy Weapons are either ignorant of the facts or in denial. You will find that trolls and those who are weak minded will make these comments and if you call them on it you will find they have not researched a single fact to back their claims. Thank you for the reply. Appreciate it. I have been reading about DEW and chemtrails for awhile now and I’m becoming educated about what is going on, however I would still like an explanation about the trees in Coffey Park and why they were different than those in the ‘woods’. Also, why were only certain bldgs hit? I understand some (in urban areas) for a land grab but bldgs like K-Mart, Well Fargo Entertainment Ctr, Cardinal Newman, etc.are still a mystery to me. Best guess among myself, savedByGrace Youtube channel, aplanetruth.info YouTube channel, and several others in our genre (Truth Seekers/TinFoilHatties :P) is that they are clearing certain cities to force the residents out. That includes ridding the area of useful stores and food establishments in order to herd the population out and into the new coming “Smart Cities” which will really be AI controlled prison reservations with a HIGH TECH control grid to keep the population in line and only allocate just what is necessary to keep the slaves running on the hamster wheels for the corporations. Many of the new fires, especially in Greece look similar to the Coffey Park and San Diego fires. Thank you for the info and for your time. I will continue to follow this post and stay alert. God help us all. In the early parts of the video, “charred asphalt” was mentioned and pointed out. 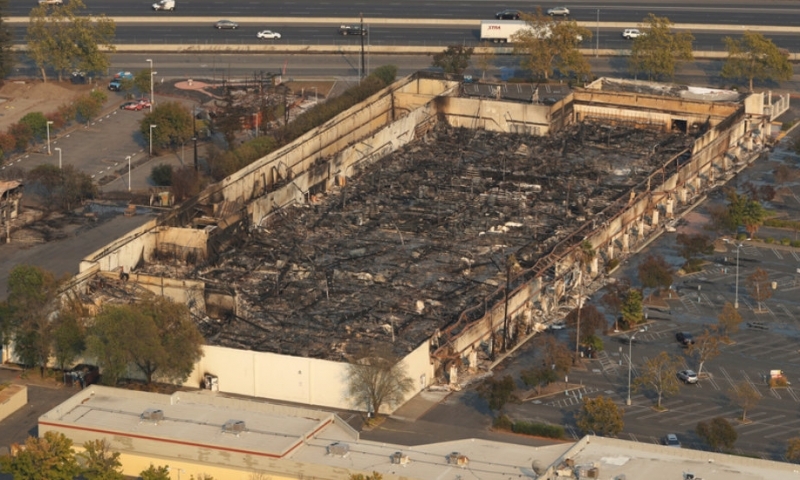 I don’t think the asphalt is what burned…there’s no metal/conductor in it. I believe they are the melted remains of recycling cans. There are metal pieces to the wheels, a metal bar for the recycling truck to pick it up with, and probably metal in the hinge for the lid to open and close. Not to mention, the bits of aluminum foil, cans, and other recyclable metal objects that would have been in the recycling cans. Just thought this was important to note. It makes it all the more astounding when you realize how very little material is left from such a large object. Jim, I had noted that as well but neglected to mention it in my article, I honestly just forgot, and it is my strong belief that the signs that were not affected as you mentioned were “grounded” and thusly the energy just passed through them and went staight into the Earth. They acted as conduits to ground and so did not have a chance to super heat.